An illusion that a pilot can experience when he or she enters a spin either intentionally or unintentionally. 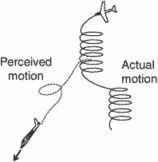 For example, a pilot who enters a spin to the left will initially have a sensation of spinning in the same direction. However, if the left spin continues, the pilot will have the sensation that the spin is progressively decreasing. At this point, if the pilot applies the right rudder to stop the left spin, he or she will suddenly sense a spin to the right. If the pilot believes that the airplane is spinning to the right and applies the left rudder to counteract, he or she will unknowingly re-enter the original left spin. Checking the turn indicator, the pilot will see it indicating a left turn but sense a right turn. This creates a sensory conflict between what the pilot sees on the instruments and what the pilot feels. If the pilot believes the body sensations, he or she may crash before taking corrective action.